We understand that one of the biggest considerations for couples planning their big day is the catering for their guests. With this in mind we have created a variety of wedding menu options for weddings of all sizes made from the freshest local ingredients. We also cater for allergies and have delicious no compromise options for your vegetarian and vegan guests too. Our wedding catering service is hassle free as we can bring the catering to you at venues throughout North Yorkshire. We regularly provide wedding catering for receptions at the Natural Retreat in Kirby Hill, Thief Hall in Northallerton and Bedale Hall but our wedding catering is available for weddings in venues throughout the area. Canapes can be a lovely way to welcome guests to your special day as well as provide a welcome distraction for guests whilst the happy couple and wedding party are having their photos taken. Our canape menu has lots to choose from including a twist on a classic Yorkshire pudding that we think will go down particularly well with your guests. Canapes packages can include either 4 or 6 options per guest, the only difficulty is picking your favourites! Our Wedding Breakfast menu is the perfect first meal to enjoy with your guests as a newlywed couple. The wedding breakfast is carefully prepared by our in house chef’s using fresh local produce and ca be enjoyed by up to 50 guests in conveniently located Richmond café bistro. 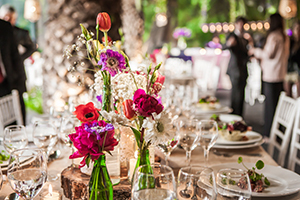 Alternatively for larger wedding parties we can provide outside catering that includes crockery, glassware, cutlery & serviettes & waitress your guests providing a seamless stress free service. Our Wedding Breakfast is available from just £40 per guest. Our delicious Evening Wedding menu is all your guests will need to prepare them for a night of dancing! We have a selection of delicious savoury and sweet buffet dishes and can deliver these to your venue to set up ahead of the arrival of evening guests. A top tip when planning your evening menu is to aim to cater for a minimum of 80% of your evening guests. Our Children’s menu has been designed to suit even the fussiest eaters and ensure clean plates and happy parents on your big day! We have main course classics like chicken goujons and chips, sausages and cheddar mash and fish and chips as well as a vegetarian tomato pasta. Our desserts will be met with equal excitement with every child’s favourite, ice cream and jelly, on the menu. 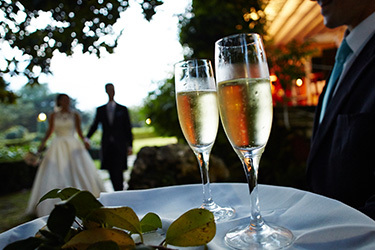 To toast the happy couple we have a fantastic Wedding Drinks package menu that includes drinks on arrival at the reception for your guests as well as during the wedding breakfast meal. A generous ½ bottle of red, white or rose wine can be allocated per guest and we even have the option to upgrade your package to include some fruity cocktails! If you would like to know more about our Wedding Catering packages please contact a member of the Penleys team who will be happy to help. Happy planning! We do taster sessions for the bride and groom at one of our cafe, Bistro's so that you can sample the food for yourselves.